Tumors of the colon are among the most prevalent cancers. Researchers at LMU have now shown that a protein promotes the formation of intestinal stem cells and thereby contributes to the initiation of tumorigenesis in the colon. The regulatory protein c-MYC plays an important role in promoting the development of many types of tumors. c-MYC is a transcription factor that controls the activity of large numbers of genes involved in cell division, and its overexpression leads to excessive cell proliferation. A new study carried out by a team led by Professor Heiko Hermeking at the Institute of Pathology at LMU (and German Cancer Consortium) now shows that c-MYC induces the production of a transcription factor, which increases the numbers of stem cells in the intestinal epithelium, and thereby contributes to the formation of adenomas (“polyps”) in the colon. Their findings appear in the online journal Nature Communications. In approximately 90% of patients that present with colon carcinoma, the expression of the c-MYC protein is strongly increased due to mutations in the APC/beta-catenin pathway. As a result, the genes activated by c-MYC are themselves upregulated. Among the targets of c-MYC is the gene AP4, which codes for the transcription factor of the same name (AP4). Transcription factors like c-MYC and AP4 act as regulatory switches that enable the genetic information encoded in specific segments of the DNA to be transcribed into messenger RNA, which programs the synthesis of the corresponding proteins. Hermeking and his colleagues had previously demonstrated that AP4 promotes the metastasis of colon tumors (i.e., the migration of tumor cells into other tissues, where they can give rise to satellite tumors). “However, the normal function of the protein in the intestinal epithelium remained unknown, and whether or not it participates in primary tumorigenesis in the organ was unclear,” Hermeking explains. In order to investigate this further, the researchers turned to an experimental mouse model for hereditary adenomatous polyposis of the colon in humans. In this ApcMin strain of mice, which is particularly prone to develop colon cancer, the team deleted the Ap4 gene specifically in the colon epithelium. “It turned out that mice which lacked the Ap4 protein developed significantly fewer tumors and survived for 100 days longer, on average, than did the mice that could still synthesize it,” says Hermeking. Surprisingly, the loss of Ap4 had no effect on the division rates of either normal or tumorous epithelial cells in the colon. Instead, deletion of Ap4 is associated with a reduction in the numbers of adult stem cells present in the tissue. “This finding confirms a recently proposed model, which postulates that the incidence of tumorigenesis is correlated with the number of stem cells in an organ. Stem cells are thus especially susceptible to malignant transformation,” says Hermeking. 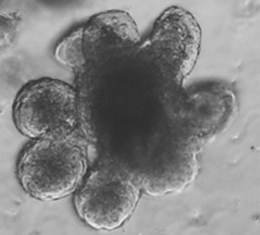 Further studies on cultured, tumor-derived, intestinal cells grown under conditions in which they form aggregations known as organoids and tumoroids validated the effect. Analysis of gene activity in these microstructures enabled the researchers to conclude that Ap4 acts on two crucial signaling pathways that regulate the balance between stem cell maintenance and differentiation, and tips the scales toward stem cells.